On 15 September, 1890, the young architect and civil engineer Harry Humfrey Rumble (1866-1948), from Westgate-on-Sea, a small seaside town in northeast Kent, England, received a patent for keyboard adding machine. Next year, on 3 November, 1891, the machine was patented in USA (US patent 462384). Let's examine the operation of the machine, using a patent drawing from the US patent (see the drawing below). The machine's chief object was to produce at a moderate cost a simple and compact machine with as few parts as possible, which will be easy to manipulate and certain in action. The machine consists, essentially, of a series of indicating-disks representing different orders of numerals and bearing numerals consecutively arranged and equally spaced around their peripheries. These indicating-disks are connected with one another by a peculiar arrangement of carrying mechanism, and when caused to rotate indicate in progression through sight-apertures in a casing which encloses them the sum of the numbers added. The rotation of any of the indicating-disks is effected by the depression of anyone of a series of operating-keys carried by a movable key-bar, each key of the series corresponding with a different numeral and being provided with a plunger, which when the key is depressed operates one of a set of rocking levers connected with the indicating-disks. A separate rocking lever is required for each indicating disk. These rocking levers are constructed in the form of frames of varying size and dispose them so as to move independently, fitting one within the other. Each rocking lever carries a striking-plate of sufficient length to receive the impact of the plungers of the entire series of keys carried by the movable key-bar, and the machine is so constructed and arranged that any one of the set of rocking-lever frames may be operated upon in turn by the series of keys. Little is know about the inventor of this seemingly simple and reliable keyboard one-column adding machine—Harry Humfrey Rumble. He was born in 1866 in Eastbourne, a resort town on England’s southeast coast, to Henry Euean Rumble (born on 9 Sep. 1834, in Great Marlow, Buckinghamshire - died 1902) and Grace Martha Rumble (née Humfrey, born оn 15 Dec. 1838 in Upton, Berkshire). Harry had two younger brothers: Herbert Montague Rumble (1867-1942), and Joseph Humfrey Rumble (1872-1892). Henry Euean Rumble was an architect, so Harry decided to continue the family trade. In 1889 Harry Rumble married to Kate Rosaline Knight. Their first son, Horace, was born the same 1889 in Reading, England. In 1891 his brother Herbert Montague married to Kate's younger sister, Mary Georgina (born on 6 July, 1872, in Ross, Herefordshire). However, in the beginning of 1892 Harry and his sister-in-law Mary Georgina had an illegitimate son—Humphrey. Naturally, there was a significant family quarrel between Harry and his brother Bertie, concerning the conception of Humphrey. That quarrel led to the migration of the elder brother's family to Australia (Harry, his pregnant wife Kate, and their sons Horace and Eric), shortly after Humphrey's birth, in the summer of 1892. In August, 1892, they established in Enmore, Sydney, when on 24 August was born their third son, Leslie Audoen Rumble (1892-1975), who became a Catholic priest. Later the family had also three daughters: Maude, Phyllis, and Dorothy (1900-1988). In 1895 the family went to Bunbury, Western Australia, where Harry obtained a position as a civil engineer in a construction company. 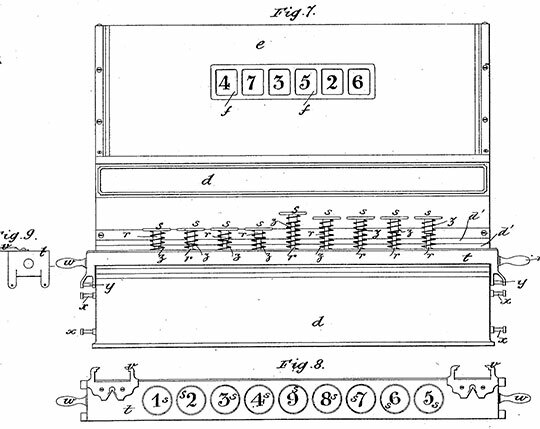 Besides the above-mentioned patent for adding machine, Harry Rumble was a holder of another GB patent (GB120766A from 1918), for Improvements in or relating to retaining walls. Harry Humfrey Rumble died on 4 July, 1948, and was interred in the Roman Catholic Cemetery, Karrakatta, Perth.